Profil Edition Gunter Hanssler has released the ultimate edition of Bach's most loved masterworks, just in time to mark the great composer's 330th birthday on March 21st, 2015. 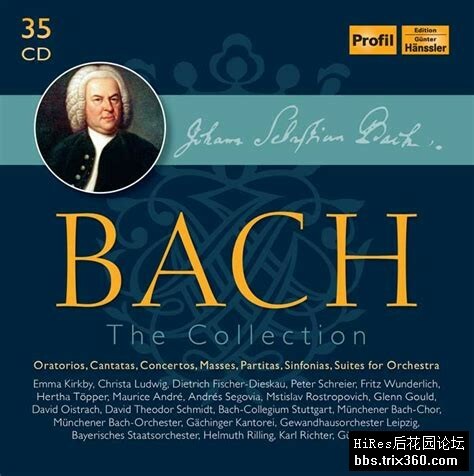 Bach's most important works appear in standard-setting recordings gathered on 35 full-length CDs. Famous Baroque performance specialists and Bach interpreters perform his sacred works such as cantatas, masses and oratorios and famous organ works, but also the secular music of the cantor of St. Thomas, including the Goldberg Variations, his Brandenburg Concertos and the harpsichord concertos, among others. Performers include Emma Kirkby, Christa Ludwig, Dietrich Fischer-Dieskau, Peter Schreier, Fritz Wunderlich, Maurice André, Andres Segovia, David Theodor Schmidt, Mstislav Rostropovich, Glenn Gould, David Oistrakh, Helmuth Rilling, Karl Richter, Günter Wand, Leonard Bernstein, G?chinger Kantorei, Bach Collegium Stuttgart, Munich Bach Orchestra, Dresden Cross Choir, St. Thomas Choir Leipzig.